This tape is super easy to use and takes all of the guesswork out of fractions. Gives both inside and outside measurements. This would make a great gift for any household. Don’t know what “summary” means! Gift for my carpenter son. It was a new thing that he had not seen before. He liked it a lot. Love it! I’m fraction handicapped and this helps me measure everything perfectly! I like this tool. It figures out my center point on any measurement. The only thing I could say for improvement would be the length of the tape. This is for 16 ft. My other tape measure is for 33 ft. But I am happy with it anyway. A really nice and useful tool! The digital display is nice but I particularly like the ability to record two measurements in memory while holding a third. It's a nice, well made tape measure! The receiver of this gift was very excited and pleased with this measuring tape so I guess this was a hit. This tape is actually a lot of fun to use. Takes the guess work out of detailed measurements. 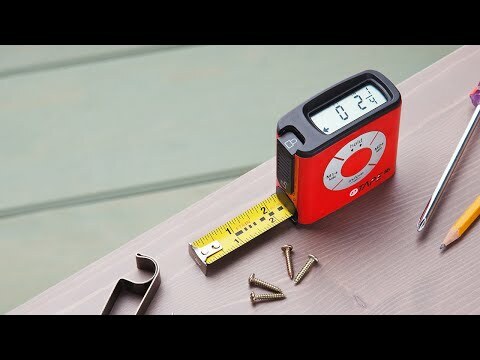 Inventor Stephen Crane has spent 15 years on a mission: to make a better tape measure. 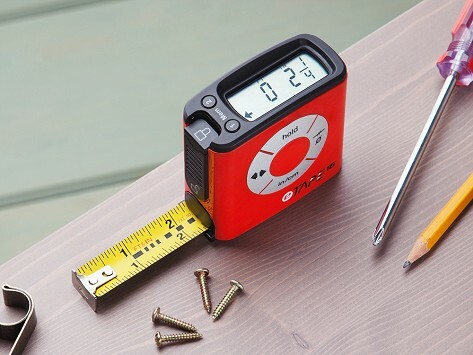 eTape16 is his third iteration—an easy-to-use physical measuring tape with digital readouts and functions. As you lengthen the measuring tape, the measurement displays on screen. Tap a button to save. Or convert measurements quickly (from fractions to decimals, or inches to centimeters, for example) and calculate midpoints (great for helping to hang a picture). And no need to bend the tape when measuring into a corner—just select the back of the device as the starting point. Ultralight Aluminum Step Stools - 3-Step 32"